My oldest daughter decided to stop eating beef a few months ago. This usually isn’t a problem since we tend to eat more chicken and fish than beef anyway. However, every once in awhile the rest of the family craves a juicy burger (of the beef variety). The last time that happened, I grabbed some pre-made shrimp burgers at the grocery store along with the hamburger patties and everyone was happy. In fact, my daughter loved the shrimp burgers so much she hounded me for the next several weeks to serve them again. I knew a recipe development opportunity when I saw it and set about recreating those shrimp burgers. Although it took 3 rounds of testing, no one complained because each iteration was really quite good. We learned that the bacon adds some nice smokiness but could be left out if you absolutely wanted to. The cheese is important for adding some richness and the Old Bay seasoning was what made my daughter declare I had finally hit the recipe. So, don’t skip the cheese and Old Bay seasoning. The best thing I learned while making 3 batches of shrimp burgers was an easier technique for forming the patties. Have you seen the life hack where you make hamburger patties by pressing the meat between two plastic take-out lids. I know the idea has been around awhile and it’s been pinned on Pinterest a million times, but I never actually tried it until now. And you know what? It totally works! The Food & Wine website has a good video showing the technique that you can see here. You hardly even have to get your hands dirty. I divided the shrimp mixture into 4 quarters in the bowl and then scooped out each section onto a lid I had sprayed with cooking spray. I used one lid for each patty (apparently, we do a lot of soup take-out in our house) and a 5th lid to form the patties. By using one lid for each patty I could easily transfer the patties to the skillet when I was ready to cook them or store them in the refrigerator if I was making them ahead of time. I have to admit learning this little kitchen hack made me wonder what else I might be missing out on. If anyone knows of any other good ones, let me know. Heat a non-stick skillet over medium heat. Add the bacon and cook until bacon is partially cooked, 5 to 6 minutes (do not let the bacon brown). Remove bacon from the skillet and let it drain on paper towels. Set the bacon aside to let cool while preparing the rest of the recipe. Wipe out the skillet but don’t wash it. In a large bowl, stir together the mayonnaise, scallions, parsley, jalapeño pepper, lemon zest, Old Bay seasoning, salt, and pepper. Set aside. In a food processor, pulse the bread until you have coarse crumbs, about 4 pulses (you should have about 3/4 cup crumbs). Mix bread crumbs into mayonnaise mixture. Wipe out the food processor, then pulse the shrimp until it is coarsely chopped. You want an even mix of finely and coarsely chopped pieces, about 7 pulses. Transfer the shrimp to the bowl with mayonnaise and breadcrumbs. Add in the cheese and cooled bacon. Gently stir the mixture until everything is evenly combined. Divide the shrimp mixture into 4 equal portions, and loosely pack each into a 1 inch-thick patty. Heat the oil in the skillet over medium-high heat until shimmering. 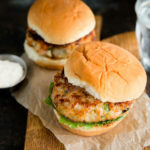 Gently lay the shrimp burgers in the skillet and cook until browned on both sides and burgers are cooked all the way through, 8 to 10 minutes. Drain on paper towels. Serve on hamburger buns with lettuce, tomato and onions, if desired. I tried them added 2 eggs and doubled recipe for 2 lbs of shrimp. Great recipe! However I think you need to come up with a great sauce to take it over the top! Great suggestion! I’ll have to give it some thought. Thanks! !